Overprint is a function that you can activate or deactivate in your design software, which basically entails that one color gets printed over another color in your artwork. When used intentionally, overprint represents an additional way to create artwork that is visually interesting and distinctive. However, if overprint is turned on without your realizing it, you will probably end up with prints that look significantly different from what you expected when designing them. 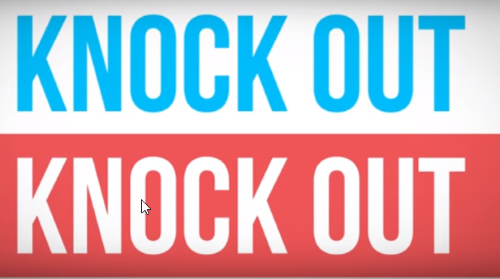 Basically, if overprint is turned off for your artwork, the color underneath will be “knocked out” so that there is no color mixing, and only the color on top will actually be printed. In other terms, with overprint turned off, only the top color is printed on the paper when multiple colors are superposed in the artwork. On the contrary, when overprint is turned on, the color underneath get printed as well, and the color on top simply printed over it as a second layer. When bottom colors are knocked out, color mixing is not possible and therefore the only color printed on the paper is the top one. With overprint turned on, the superposed colors mix, and create a color that is different from the top one. Sometimes the knock out behind dark colors can be seen if printing equipment is not set up perfectly, in which cases it’s better to turn overprint on. Turning on overprint is usually done to create visually special effects and to print black over lighter colors. To manage the Overprint setting in Adobe Illustrator, open your artwork and go to Window > Attributes to select the options. Overprint can also be simulated in Adobe Acrobat by selecting Output Preview. Setting up artwork files for printing can be tricky, and unexpected outcomes occur frequently. At Gogoprint we want to help you to avoid this, and therefore try to cover most of the problem areas in blog articles. Keep posted and check our blog on a regular basis for help and tips about online printing, artwork design and closing, and print marketing in general.